We’re having a warehouse sale and everything must go, except for this one vintage industrial warehouse pendant. That’s right, I’m willing to give it all away except for this one black pendant. I know every item in the warehouse should be up for sale but I just can’t bring myself to part with this one pendant. We go way back together. It’s like that favorite pair of jeans that you want to wear day after day. You feel comfortable together and no other pair will feel quite the same. Call it strange but I have the same obsession with my lights. Of course I found this pendant in an old warehouse. In fact, I found about one hundred of these lights. It was a big warehouse and they needed a lot of big lights. Back then there were no LED light bulbs and generally light fixtures only had one light bulb each. So you needed a lot of them to light up the walls and the warehouse floor. I was careful to save this one pendant for myself. I found the perfect spot to hang it in my home. Not the kitchen island. Instead I chose to hang it over the farmhouse kitchen table. Very vintage industrial. And now I’m selling my home and I have no where to hang my favorite pendant. The new place is too small and the ceiling too low. But I can’t leave this light behind. It will probably take a break and rest in the closet for awhile until I can figure out how to use it again. That’s OK because sometimes it’s just hard to give up the things you like. As long as it doesn’t become an issue of hoarding. Time to put my jeans on. 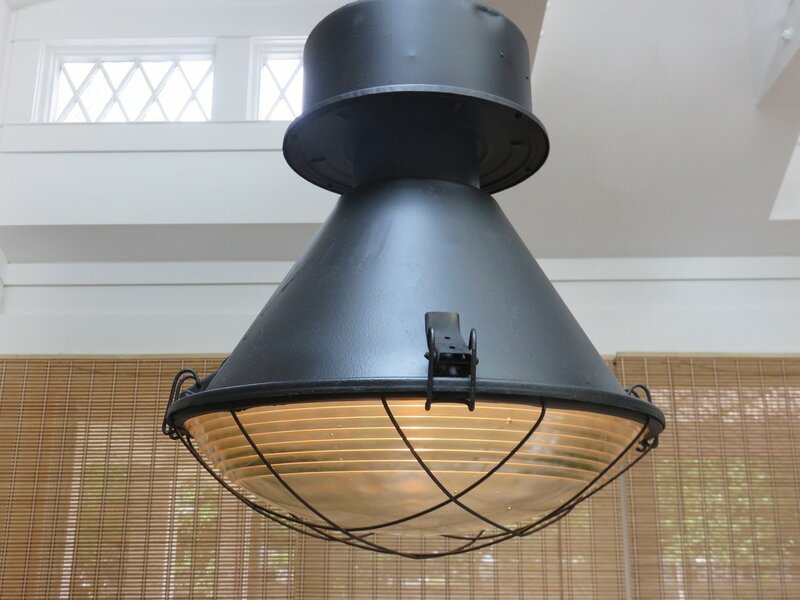 Click HERE to view Vintage Industrial Warehouse Pendant at Hudson Goods. Click Hip Lighting, Furniture Frenzy, Industrial Strength or Chairs Gone Wild for more interior home design.